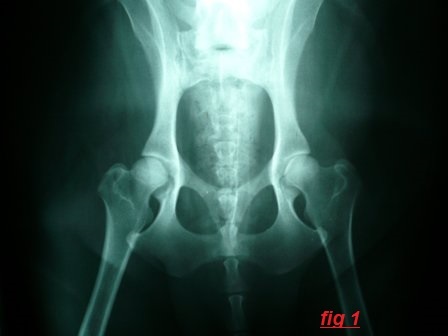 Hip dysplasia is a common and often debilitating orthopaedic condition characterised by instability of the hip joint which affects many larger breed dogs. 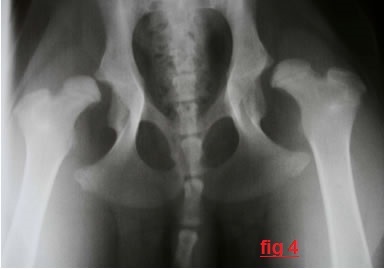 It is generally considered that puppies are born with normal conformation of the hip joint ie a smoothly fitting ball-and-socket joint comprising of the femoral head (ball) and the acetabulum (the socket). See Figure 1. The mechanism by which dysplastic hips become lax and unstable is due to many factors but these include both genetic and environmental. 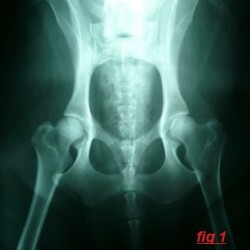 The underlying cause is a laxity of the soft tissues supporting the hip joint; in severe cases this can be detected by your vet at first vaccination. However, because it occurs in young dogs when the bones are still partly cartilaginous so therefore soft instead of ossifying into a normal hard boney well fitting ball-and-socket conformation, the femoral head and acetabulum form a shallow, less congruous joint. Arthritic new bone also forms due to stresses on the soft tissue components of the joint and further remodelling changes occur. See Figure 2. 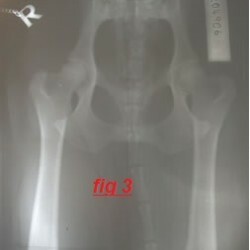 A diagnostic X-ray (See Figure 3) can then be submitted to the BVA together with the scoring fee and a part-completed certificate. The vet then signs to certify the radiograph was taken on the date indicated and may check and add the dog’s microchip or tattoo number. 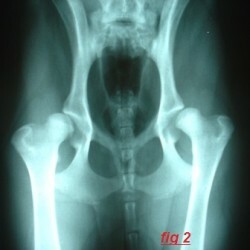 Until the latter becomes mandatory the substitution of dogs with known good hips could occur by unscrupulous breeders. One could consider this may be a case for DNA profiling to become more the norm.The radiograph is then examined by two scrutineers, randomly paired, from a panel of (currently) thirteen, all who have been trained in hip dysplasia assessment. Each year they set a quality control exercise to check each scrutineer. Under the scoring scheme, nine radiographic features for each hip are assessed with a numerical score given to each (0-6). Points are given to each undesirable feature with zero being a perfect example of that feature. The individual scores are then summated giving a total for each hip and a total score for the dog. One feature is scored between 0-5 (caudal acetabular edge) so with the other eight scoring 0-6, the total parameters for each hip may range from 0-53 and for a given dog so giving a possible total score of between 0 and 106. See Table 1.This means that meaningful comparisons between dogs may be achieved. As with most things, this system has it’s limitations and is by no means foolproof. It can only detect if a dog has reasonable hips not whether the dog carries hip dysplasia genes. It cannot take into account environmental factors such as diet and body weight. The score does not take into account the age of the dog except that it has to be over 1 year of age. This a subjective scoring scheme and scrutineers do differ in opinion hence, the need for annual quality control to limit personal variations and ensure as far as possible scores do not have a large variance. Due to the complexities of genetics, relying on a just a sire and dam with a low score may produce offspring with varying degrees of hip dysplasia, which can obviously be very disappointing. Unfortunately, there are some veterinary surgeons in practice who do little to support the scheme. They bias the results by discouraging owners from submitting radiographs which they think may score highly. As a summary of the scoring system the lower the score the better. 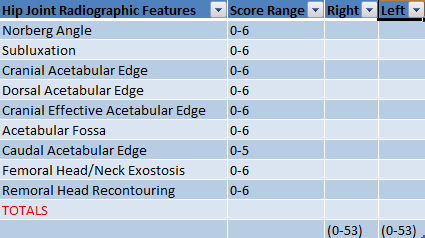 Hips scores of 0,0 (Total=0) being perfect and 53,53 (Total = maximum 106) devastatingly dreadful. For each breed there is an average score obtained, which is continually being updated, this is known as the breed mean score (BMS). The BMS for Hungarian Vizslas is at present a total of 12. As breeders and as potential puppy purchasers how is the scheme best used? Only breed from dogs with no more than the breed mean score (BMS). Currently for Hungarian Vizslas the BMS=12 (Up to 31/12/2014 after 2655 hip scores submitted). I personally would suggest choose parents with scores of 10 or less. For example a dog with 0,0 is excellent, 3,3 very good, 6,6 not so good but still within the breed average whilst anything above this is not good so try to avoid. 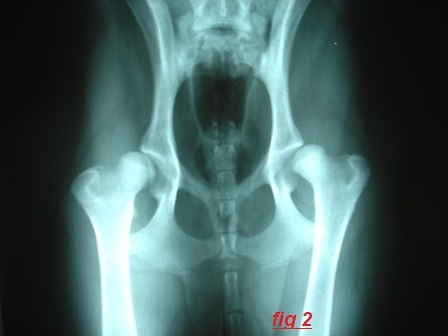 Even mating two low scored dogs, offspring may still have varying degrees of hip dysplasia. The most helpful way of using the scoring information is in progeny testing, for example, selecting parents who are known to have previously produced offspring with good hips as well as have good scores themselves. It has been proven that some dogs with good hips will consistently produce progeny with hip dysplasia whilst others do not. Ideally it is important to research the hip scores of as many offspring of individual dogs before considering a match for breeding. Obviously, this can be more easily applied to sires as they are likely to produce more offspring in their lifetime. It’s all in the genes! It is useful to check the grandparents too as their scores will have a bearing on the offspring. So by checking back through the line you can minimise the chances of throwing a pup with bad hips. But, if in doubt as to the suitability of your dog to breed it is best to seek advise from a vet who will have been sent the current breed mean scores when the certificate was returned to him/her. Or ideally a vet who has an interest in orthopaedics. Temperament and ability obviously all count in choosing the right match but remember, it is theoretically possible for people who purchase a pup which develops hip dysplasia to sue a breeder who bred from affected parents. In practice, the number of clients who continue to breed from their dogs either without hip scoring or who worse, ignore the score indication staggers me. Likewise there are the new puppy owners who look blankly when you ask what the parents hip scores were. Too often have I had to euthanase an otherwise healthy puppy which can’t bear it’s own weight or suffers pain. See Figure 4. I would prefer not to be put in this situation so I strongly urge responsible breeding in any breed let alone my own, the Hungarian Vizsla. I strongly recommend breeders advise prospective owners to insure their animals because should the problem arise. As vets can do so much more when there are no financial constraints. In addition, I recommend the use of nutriceuticals e.g. glucosamine and chondroitin sulphate, during the skeletal development stage. This can be administered either in feed or ideally one of the veterinary prescribed extremely pure formulations such as Synoquin®, Seroquin® or Cortiflex®. There are others on the market but I tend to subscribe to the thought that quality and purity comes at a cost. Figure 4: This pup was bred from hip scored parents for the purpose of working. He was euthanased at 7 months old. Your vet is the first port of call. Specialist orthopaedic vets would be contactable by referral through your vet but often a practice has a vet with a keen interest in orthopaedics and who has done further learning in the subject. In addition there is the charge by your vet to include sedation/GA and X-ray, this cost varies according to the surgery charges. The anaesthetic issue is a hangover from “the good old days/James Herriot era”. Modern anaesthetics are extremely safe, the Gold standard most often used in practice being propofol induction and isofluorane gaseous maintenance. These have come from the medical field where they are routinely used on 90 year olds having hip replacements! As long as a dog is fit and healthy there is minimal risk with any anaesthetic procedure. The author’s practice routinely uses a reversable sedation for hip scoring, which takes 7 minutes to standing after reversal. This combination is medetomidine (Domitor) and butorphanol (Torbugesic) which is reversed by atipamezole (Antisedan). Again this combination is exceedingly safe in young fit animals ie the healthy breeding animal! The risks of anaesthesia is far outweighed by the risks of producing crippled animals which will suffer and no doubt need long anaesthetics to aid their condition! This should not be an excuse for not hip-scoring your dog.